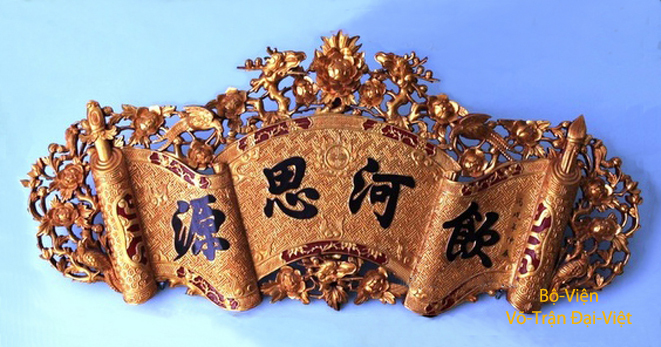 The Traditìon of « Spiritual Founders Commemoration Feats »is remained in all Martial Arts School of Việt-Nam. Thus, every year, the Bình-Định SA-LONG-CƯƠNG school system is continuing the tradition celebrating - on the November 11st - the Commemoration feast of the two spiritual founders Bodhidharma and Quan-Công (Saint Duke named Quan) according to the Tradition of Cults in Martial Temples from the Culture of Việt people. In addition, the SA-LONG-CƯƠNG Martial Arts School System celebrate also each year the Anniversary of Great-Master Trương-Thanh-Ðăng death, on August 2nd of Lunar Calendar or September 16th of solar calendar. 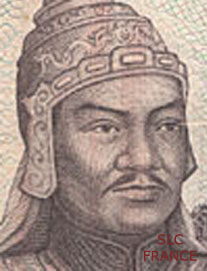 As for Quang-Trung Emperor (1752-1792) of Tây-Sơn Dynasty (1788-1802), he was venerated by Traditional Martial Arts Schools of Bình-Định, in this last times after 1975, as Spiritual Founder of Tây-Sơn Martial Arts. In reality, Traditional Martial Arts Schools of Bình-Định had existed for a long time before the coming of Quang-Trung Nguyễn-Huệ Emperor in the world. The question asked is to know why theses two personalities are venerated as Spiritual Founders of Việt-Nam Traditional martial arts. To answer that question, one must know that in the culture of the Vietnamese people, each corporation of workers knows clearly its Founder’s biography, on the other hand, Martial arts don’t know their Founders. At the same time, countries like China , Japan , Korea .. don’t know exactly who are the Founders of their Martial Arts. 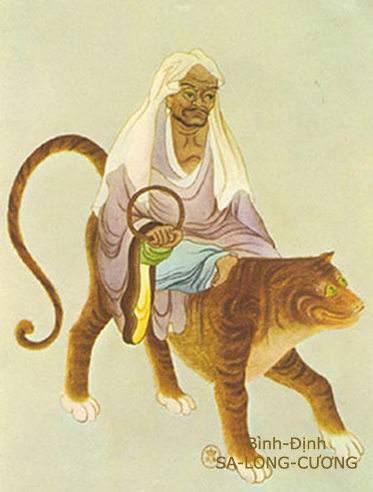 A long time ago, during the Ly dynasty (1010 – 1225), the Viêt people were venerating the Tutelary God of Tản-Viên mountain (Sơn-Tinh), named Nguyễn-Tuấn, son-in-law of King Hùng-Duệ from Hồng-Bàng dynasty (2879-258 BC) as Master Founder of the Art of Fight, and were adoring the Lord Cao-Lỗ, famous generallissimo of An-Dương-Vương (258-208 BC) as Master Founder of archery. Later, the Martial Arts company from Liễu-Đôi village at Hà-Nam-Ninh venerated the Saint named Đoàn as Master-Founder of the Art of Fight. 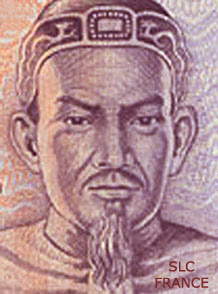 Later, the Martial Arts Company of the village Liễu-Ðôi at Hà-Nam-Ninh venered the Saint named Ðoàn as Master Founder of the Art of Fight. At that time, the others Vietnamese martial arts didn’t knew any Master Founder to venerate. Under the Lý dynasty (1010 - 1225), the three religions - Taoism, Buddhism and Confucianism - were prospering, especially Buddhism. As a consequence, during the inauguration of the Nation’s Sons School (Quốc-Tử-Giám) in the Year of the Dragon 1076 and to recruit talented men for the military field and civil field, the Emperor LÝ-Nhân-Tông instituted firstly the veneration of Confucius (Khổng-Phu-Tử) - representing Confucianism - as the Saint Founder of Literature Arts and secondly the adoration of Bodhidharma - representing the Buddishm - and Quan-Công (Duke named Quan), disciple of the immortal Phổ-Tịnh (Pŭ Jìng - 普 淨) – representing Taoism - as the two Spiritual Founders of Martial Arts. - A Martial Temple to venerate, in the principal room, the Great Duke Lữ-Vọng (strategist of the King Wen from Zhou - 周 Dynasty), and the Great King Quốc-Tuấn Trần-Hưng-Đạo (winner Mongols generallisimo). Laterally, the eastern hall, called Oriental Martial Temple, was reserved to the adoration of the strategist Tôn-Võ-Tử (Sun Wu-Zi - 孫 武 子) and the latter situated in the west, called Occidental Martial Temple, was dedicated to the strategist Quản-Tử (Guan Zi - 管 子) (Quản-Di-Ngô - Guan Yi-Wu - 管 夷 吾), (two famous strategist of Warring Kingdoms) – a cult was also dedicated there to Eighteen Military Deities, divided in two groups apparts. The Cult celebrated at Martial Temples was organized two times a year, in Autumn and in Spring. Votive objects conformed to specific ruling. However, they could be changed according to each Imperial Dynasty but it was essentially always "Three Sacrificial Victims" (buffle, porc and goat) and "Three Offering Categories " (incense, flowers and fruits) . 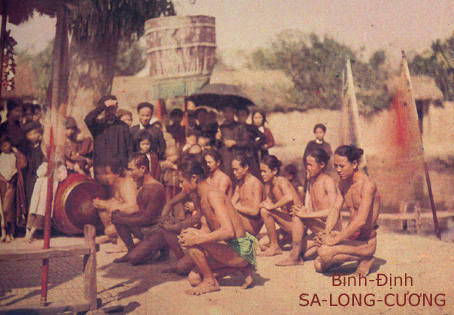 As a consequence, the commemorative tradition of the two Spiritual Founders Bodhidharma and Quan-Công in the traditional Martial Arts of Viet-Nam were preserved since these ancient time until nowadays according to the Tradition of Cults in Martial Temples and were perpetuated in the BÌNH-ĐỊNH SA-LONG-CƯƠNG Martial Arts School System, each year on October 5th of Lunar calendar. 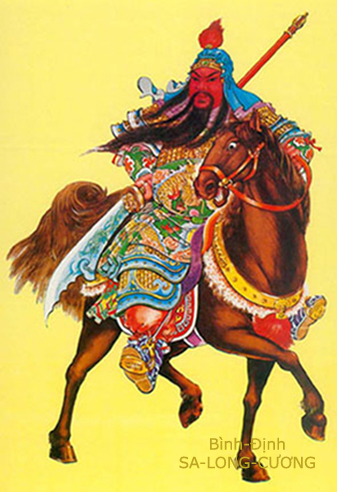 But Bodhidharma and Quan-Công were not the inventors of Traditionnal Martial Arts of Việt-Nam, their vénération as Spiritual Founders since the old days, comes close to spiritual and metaphysical point of view ; while the veneration of People's Heros comes close to gratitude domain and patriotic mind. - “Ancient Historiography of State in Việt-Nam - Text and Commentary of the Complete Mirror of Việt History established by Impérial Order (Khâm-Ðịnh Việt-Sử Thông-Giám Cương-Mục)” Institut of the Nation History (Quốc-Sử Quán) Publication, 1856-1884. (Cf. Translation and Explanatories Notes by Philippe LANGLET ; Ecole Française d’Extrême-Orient). - “Martial Temple at Huế and Feats of Arms Steles of Martial Arts Doctors” (Võ-Miếu Huế và Những Tấm Bia Võ-Công Tiến-Sĩ) from Hải-Trung - Magazine of Arts for Youth. 11-1998. - “Cursory Biographies of Divinities and Founders of various Bodies of Trades (Lược-Truyện Thần-Tổ Các Ngành Nghề)” from Vũ Ngọc Khánh, Khoa-Học Xả-Hội Publication,1990. - “Ways and Customs of Việt-Nam (Việt-Nam Phong-Tục)” from Phan Kế Bính, 1915. - “Compendium of Sighted and Heard Things (Kiến Văn Tiểu Lục)” from Lê-Quí-Ðôn, 1779. - “Compendium of Invisible Powers of Viet Country (Việt-Ðiện U-Linh Tập)” from Lý-Tế- Xuyên, Trần Dynasty, 14th century. - “The Six Gates-Ways of the Little Troglodytical Residence (Thiếu-Thất Lục-Môn - Sáu Cửa vào Động Thiếu-Thất)", traduction from Trúc-Thiên, An-Tiêm Publication, 1969. - “The Vietnamese Immortals according to the Hội Chân Biên”, from Archeologia Institute of Saigon Publication. - “Introduction to Asia” from Jean Herbert, Albin Michel Publication. - “A Certain Number of Commemorative Ceremonies and Customs in Traditional Martial Arts Drill Halls”, from Bình-Định Online's 9th Article on Internet, updated on November 10th 2006.